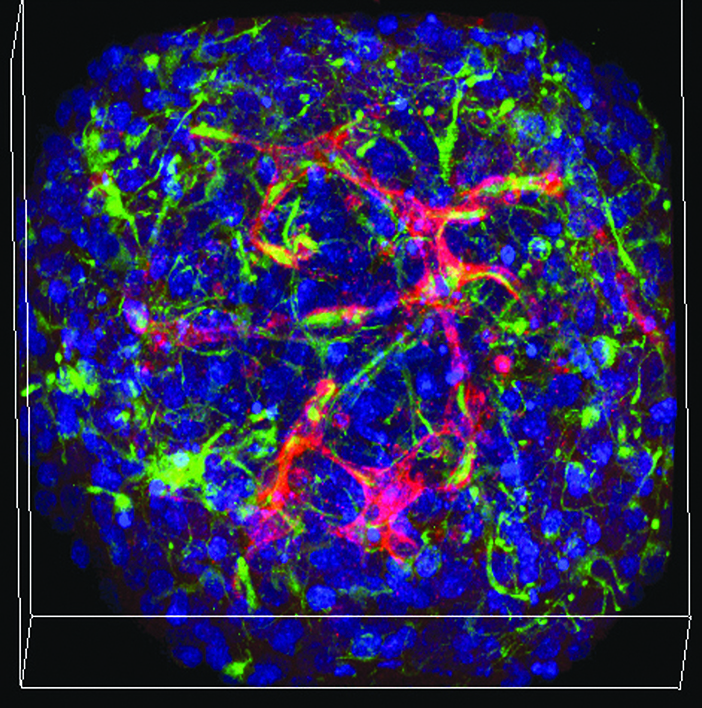 Lab's mini-brains grow blood vessels in vitro. Courtesy Hoffman-Kim lab. Neural model gives rise to vessels, too. Using nerve cells from an animal, a petri dish, and a little patience, Diane Hoffman-Kim’s lab first described a method for growing mini-brains in 2015. Now a new finding is exciting in an entirely new vein: these mini-brains can also grow blood vessels. “This is exciting because real brains have vasculature. We rely on it,” says Hoffman-Kim PhD’93, an associate professor of medical science and of engineering, whose lab collaborated with others at Brown to build the minibrains. “For our neurons to do their thing, they have to be close to some blood vessels. If we are going to study lab models of the brain, we would love for them to have vasculature, too,” she says. Hoffman-Kim, who is the senior author of a study published in the Journal of Neuroscience Methods in January, says the networks of capillaries within the little balls of nervous system cells could enable new kinds of large-scale lab investigations into diseases, such as stroke or concussion, where the interaction between the brain and its circulatory system is paramount. Right now there’s no blood in the mini-brains, she says; they exist in an agarose wellplate, not a living animal. But she’s working with a colleague at Brown to find a way to connect the mini-brains with a microfluidic apparatus that could produce an external source of circulation, to make the model more realistic. “We’ve sketched on a few napkins together,” she says. She notes that the capillary networks are not as dense as they would be in a real brain. The study also shows that they don’t last longer than about a week or two. But they can be made by the hundreds, and could allow scientists to observe how the brain responds to injury and other lab-created conditions, with less need for animal models.